The Ministry of Environment Forest & Climate Change (MoEFCC), Government of India invites applications from students pursuing graduation or post-graduation or carrying out research work at any recognized University/ Institution within India or abroad for a three-month long internship. This Environmental Internship is as part of the Ministry of Environment, Forest and Climate Change Internship Scheme which is aimed at allowing young academic talent to be associated with the Ministry’s work for mutual benefit. The Selected Interns shall have an opportunity to know about the Government functioning and Regulatory and Developmental Policy issues and contribute in its amendment, if required, by generating inputs such as empirical analysis, briefing reports, policy papers, etc. Selected Interns will be required to have their own laptops. The Ministry shall provide them with working space, Internet facility and other necessities. Interested Applicants may apply online only by clicking here. Interns must also clearly indicate the area of interest. The interns shall have the option to apply in one discipline only. At the time of joining on selection, applicants shall be required to produce a letter from their Supervisor/ Head of Department/ Principal, indicating their status in the Institution and No Objection for allowing their student to undergo Internship programme for the period for which he or she is selected. A Certificate regarding successful completion of Internship shall be issued by the Division Head of the concerned Division after the successful completion of the internship. In addition, a stipend of Rs. 10,000/- per month will also be paid to the intern subject to successful completion of the work allotted. Click here to read further information about this internship. 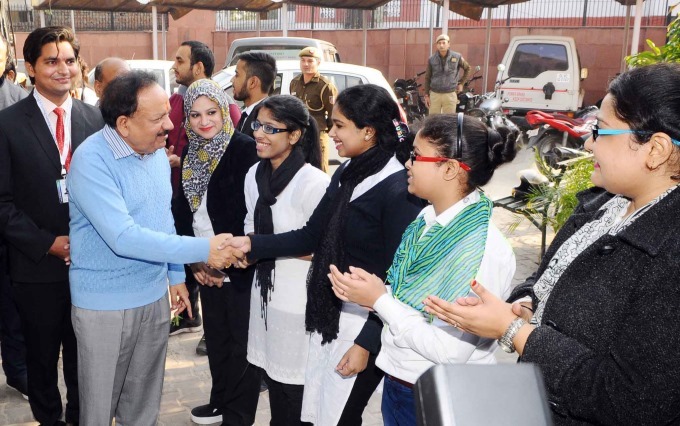 Top image: Environment Minister Dr. Harsh Vardhan at the Skill India Training Centre at Jama Masjid.